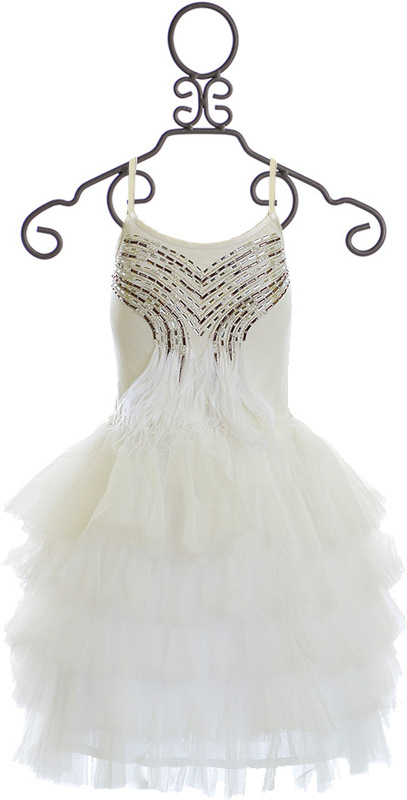 $128.8 - Twirl and dance the night away in this gorgeous gown from Tutu Du Monde! The bodice of the dress features a scooped neckline and thin tank style dress with adjustable straps so she can wear the dress as she grows. Beads of shiny dark grey and sassy jet black create flowing lines down the front of the bodice to the ruffled waistline. Tiers of sweet white tulle fall in layers to just below her knees and create a special occasion look she will surely fall for. 100% Cotton Knit and 100% Nylon Net Shell, 100% Cotton Woven Lining, Exclusive of Decoration. Dry Clean Only!